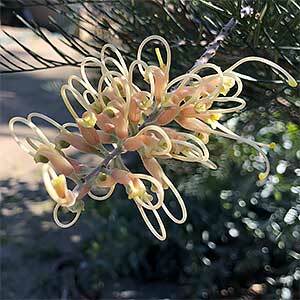 A wonderful winter flowering plant Grevillea Ivory Whip has large ‘Ivory White’ flowers. Although winter is the main flowering g period, this is a variety that will flower almost right through the year in good conditions. The dense foliage is a haven for birds, and a short but stout trunk raises the canopy so that a variety of shade loving plants could be grown underneath. During long dry periods a deep watering will keep the plant looking good. Flowers – White with pink..
Flowering time – Winter to Spring with spot flowering year round.